In a small bowl, whisk the lime juice, salt, pepper sauce and 4 teaspoons oil; set aside. In a large skillet, saute corn in remaining oil until tender. 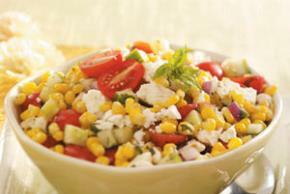 Transfer corn to a salad bowl; add the tomatoes, cucumber, onion and basil. Drizzle with dressing and toss to coat. Let stand for 10 minutes before serving or refrigerate until chilled. Sprinkle with cheese just before serving.